Getting Sprite ready to travel home. Maria and Mary unwrapping Sprite after coming off trailer. We never saw her in the kill pen. I’m sure it’s because she’s small and very quiet and was well hidden packed in between the other 35 adult horses. When she came through, my heart was instantly broken. We could tell she was young, definitely a year old or less. She was unusually quiet for such a young horse. I noticed her back ankle immediately. It was huge and her hoof was completely curled up like an elf shoe. Somehow this little girl in her short life had become severely broken, but how? The bidding started at $50 but NOBODY bid on her, it went down to $20, then $10. I raised my hand and she was ours. Nobody wanted her, NOBODY, not even the killers. She was truly an unwanted horse. So, for a mere $10.00, we brought her home. 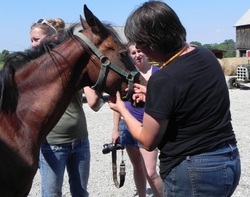 When we went to the pickup pen, she was hanging out with the Belgian Draft Mare we won. It appeared they knew each other, I guessed they possibly came from the same farm. We discovered she had other injuries besides the ankle. She had a SEVERE laceration under her jaw, it looked like it was over a week old and was starting to look infected. She also had a cut on her front ankle but we couldn’t tell how deep it was. 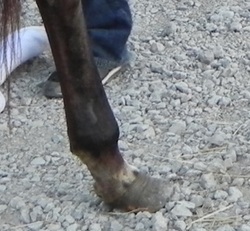 Her hind ankle appeared to have suffered a severe traumatic injury, most likely broken. It is almost healed or at least fused. There is very little movement in it and unfortunately, she will most likely never be able to be ridden. The cut under her jaw was so deep it went all the way to the bone. Obviously nobody bothered to even try to treat it, they just threw her away because she became inconvenient. She was an absolute doll to handle and loaded on the trailer next to the stallion like she had done it a million times. Puncture wound under Sprite's jaw.